Every once in a lifetime something amazing happens and you almost can't believe it. You pause for a half a second and think that this might be too good to be true, but then snap back to this new reality of the fact that this amazing, wonderful, truly unbelievable thing is actually happening and you are there to be a part of it. Next Monday, I will get to witness the beauty and miracle of people. I will be experiencing what being a teacher is really all about - making a difference. Of course, I didn't do it alone! Sometimes I feel like I didn't actually DO anything, but I chuckle and think that is just silly. We all had a part in this: me, my students, my family, my friends, strangers, caregivers, teachers I have never met and students I have never met. That's also the beauty and miracle of people. All of the most amazing things that happen in our world are never the doing of just one person. It can start with one person, one thing, one event, one idea, one sentence, one word, one thought, but nothing truly astonishing or earth-shatteringly crazy awesome ever happens by the doing of just one single person. That fact is what I find to be so reassuring and exciting about this whole experience. The ripple effect of kindness is where we can begin to celebrate. The good deed itself? We never usually get to see where our good deeds end up, how they changed someone's life. When we do a good deed, it changes us in a small, but important way. We feel a little bit better about something. We know that we are the good in the world and move on to finish living our life until the opportunity to do another act of kindness shows itself. But on Monday, my students and I get to see, with our very own eyes, the culmination of our good deeds combined with others and how they changed someone's life. 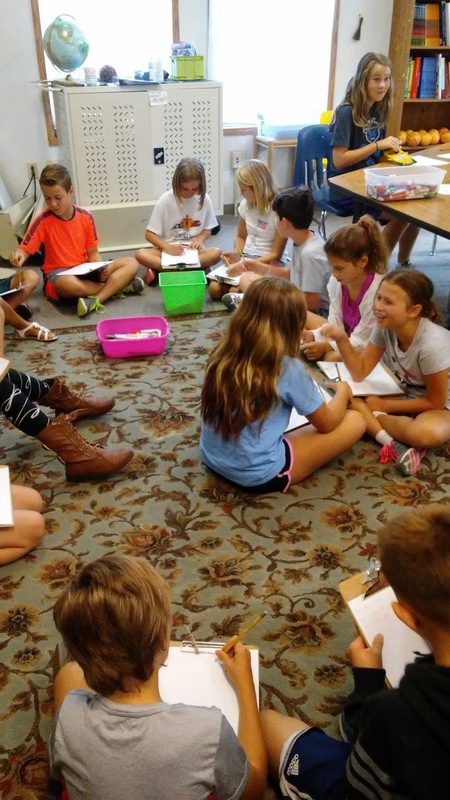 Every week before Labor Day weekend, I assign my students the simple task of going out into their world and performing a good deed. It can be anything from washing a car for someone, to leaving flowers at a doorstep, to donating to a charity, to smiling and saying hello and asking a new student to play. Literally anything that would add a little sunshine into someone's life. 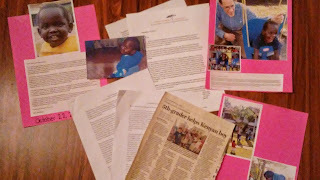 Last school year, my student Jack decided to take his spending money and donate to a charity called the Amani Children's Foundation in Winston-Salem, NC (a foundation that partners with New Life Home in Nairobi, Kenya to give babies care, love and learning until adopted by a loving Kenyan family). A couple weeks after Jack sent his money to Amani Children's Foundation, he received a letter from Jane at Amani. That is when my class and I learned about Daniel. In Jane's letter, she expressed gratitude for Jack's gift. She said it came at just the right moment. Jane had been working with New Life Home in Kenya to help Daniel, a newborn who was found by an older women that saw him by a trash heap, covered in rags the day after the tragic terrorist attack in Nairobi in 2013. This brave woman took Daniel to New Life Home when the entire town was so riveted by the terrorist attack that no one was on the streets, but at home staying safe. New Life Home worked to save this dying baby and with their care and love, he survived and developed seemingly just as his peers. However, as Daniel grew older, it was discovered that he was completely deaf. One by one, his friends around him were chosen for adoption. In the summer of 2015, an Amani intern, Casey from Indianapolis fell in love with Daniel. She held a bead party to raise money and arranged for Daniel to get surgery from Dr. Copeland for Cochlear implants. This is a procedure that is not available in Kenya. 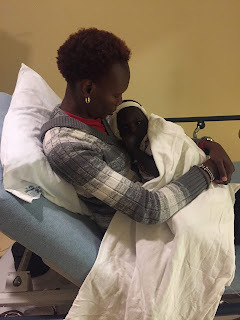 When Jane from Amani (North Carolina) heard that Dr. Copeland was willing to do the surgery and that Casey earned enough to pay the cost of supplies, Jane vowed that Amani would raise the funds to bring Daniel from Kenya to the US for his surgery. That was the day Jack's donation arrived. This was the inspiration Jane and everyone at Amani needed to keep fighting for Daniel to one day be able to hear! 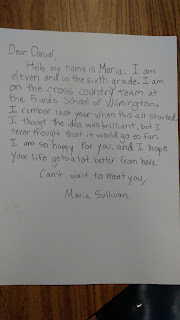 When Jack shared this letter with our class last September, it brought tears to my eyes. The rest of the class felt the same way because after Jack read the letter, the kids were determined to make this happen for Daniel, too! The plan became to place an envelope at the front of the room and kids would put money inside as they did chores, etc at home and earned money for Daniel. Every Friday, Jack took the money from the envelope and gave it to his mom to send to Amani for Daniel. Later that week, my mom arrived at our school to celebrate a character's birthday from a book that teaches the value of being kind. We had a birthday cake and all! We shared Jane's letter with my mom and she was so touched that she wrote Amani Children's Foundation a check for $200 and placed it in our classroom envelope! 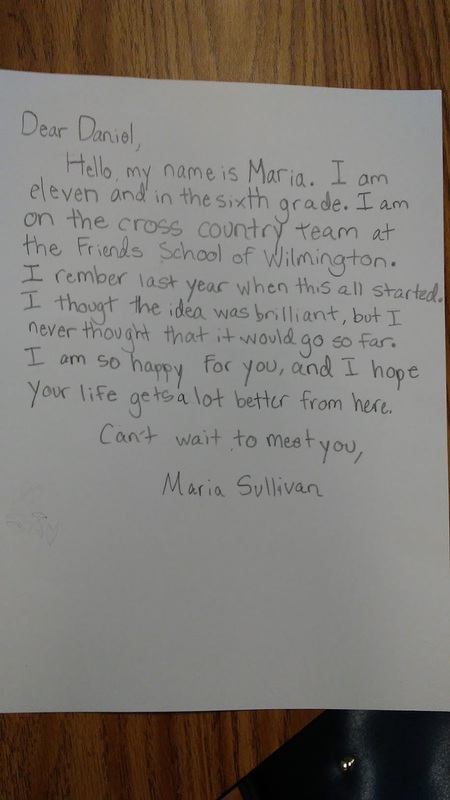 My students then started to think, "If we shared this letter with her and got $200, imagine if we shared this story with more people! We could raise all of the money Daniel needs to get his Cochlear implants!" And so as suggested by my mom, Jack's mom started a Go Fund Me page for Daniel. Through that Go Fund Me page, there have been many donations! 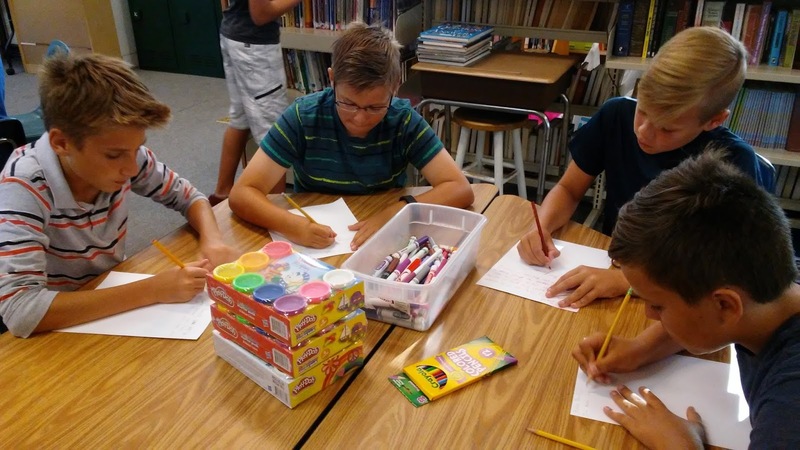 We were interviewed by a local newspaper and our story was shared and more people started giving! I asked family members, friends and colleagues. My students kept collecting money and telling more people. 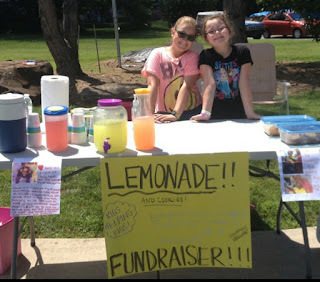 My little cousin, who when she heard about Daniel, said she wanted to donate $3,000, but settled on $300 also set up lemonade stands to help raise even more! Teachers from other schools in town heard about Daniel and donated money on the Go Fund Me page. If you look on that page, you will see some donations have a little note attached; all sharing their support and love for Daniel. 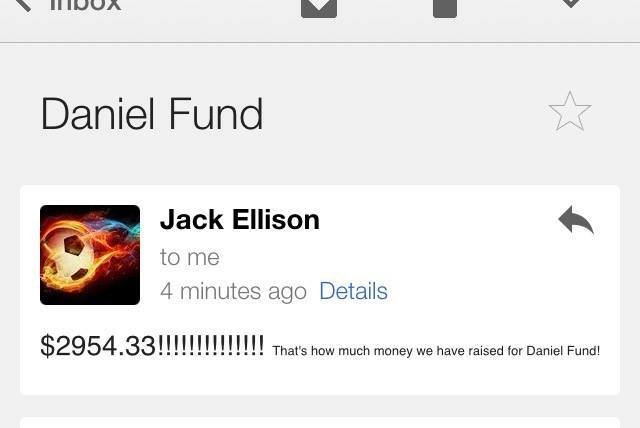 The day I got this email from Jack, we were all convinced that this would happen for Daniel one way or another! 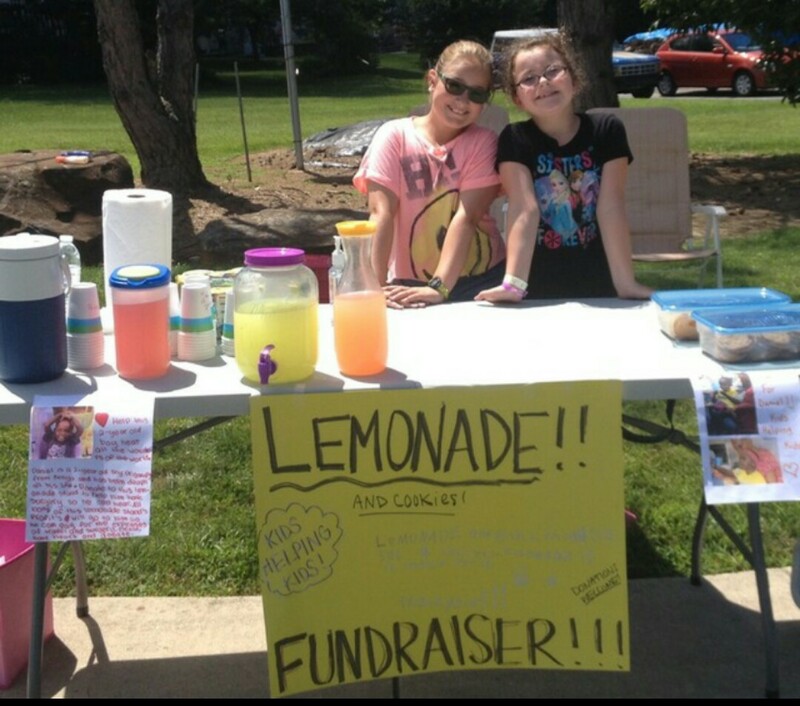 My cousin Jada and her friend running their Lemonade Fundraiser! "Daniel is active and independent, always eager to move about and try something new. However, he also connects wonderfully with caretakers, volunteers and peers. His interactions utilize vision, and especially touch." "Daniel is often seen looking upward at the sky, or focusing on an outward object trying to discover the world around him with his eyes. When with another person, he connects through touch. He will feel the different texture of your clothes or hair, but is especially gentle for a young child. Daniel seems especially comforted when one holds his hand or rubs his arm, communicating back with touch. Daniel will never object to this kind of affection." "Daniel's kindness, perseverance and gentle manner make him a true blessing to anyone around him." "This whole enterprise has been exciting as this charming two year old has pulled individuals from Kenya to Indy to Wilmington to work on his behalf against all odds." It was in January that my class learned about some of the setbacks that occurred. At one point, the x-rays that were sent to Dr. Copeland from Kenya were ruined somehow and came up blank when he opened them. 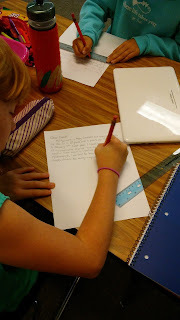 Jane also took the time to write a long letter to our class explaining the process to have Daniel and his caregiver Yvonne obtain visas to come to the United States which was a bit of a shock to us. We had no idea what it takes to get people into our country just for a visit to the doctor, especially how hard for a child with no official birth records! 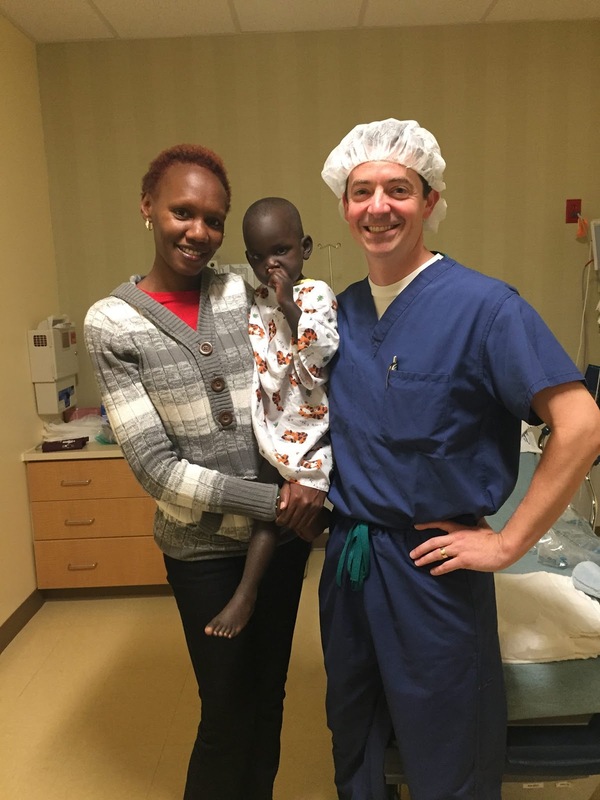 However, this past June, Daniel and Yvonne made their way to Indianapolis and Daniel received his surgery from Dr. Copeland! Yvonne, Daniel and Dr. Copeland! Daniel's first night of hearing! Daniel is coming to Wilmington! Over the summer, I also learned that Daniel would be making his way from Indianapolis to Wilmington, NC so he can meet more of the people who had his back and helped get him his surgery!! I can't even begin to explain how unbelievable this truly is! Almost like a fairy tale that the kids get to see their good deeds come full-circle when they meet Daniel and hug and kiss him and play with him! To plan for his arrival, students decided they would like to meet him in our classroom and then take him to the Garden House on campus to have lunch and play activities in different stations! 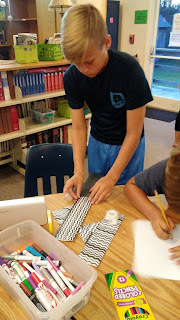 My (now) 6th graders put together a play dough station, a face-painting/dancing/blocks station, a beading station and an obstacle course with a scavenger hunt! 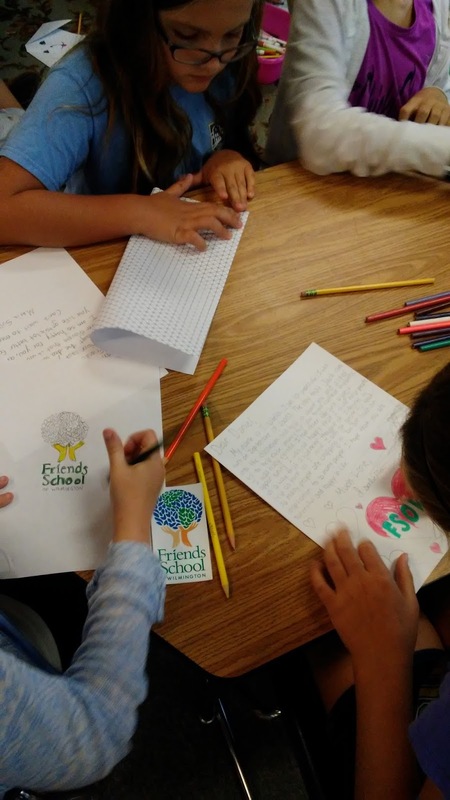 The next thing students did was make a page with a picture and a letter to Daniel. We are going to bind them all together to make a book for him to take back to Kenya! This will serve as his reminder of how much he is loved by so many people!! In Jane's first letter to Jack in Sept 2015, she ended it with this: "My prayer is that you and your family will be able to visit New Life Home some time in the next few years. 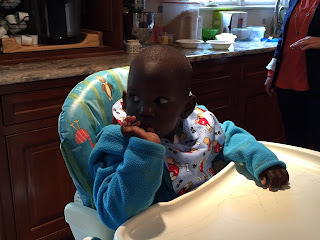 By that time, God willing, Daniel will be a robust little boy with an adoptive Kenyan family and will be able to hear!!" Little did anyone know that it would be Daniel traveling to Wilmington to meet all of us!! Funny how things turn out! Stay tuned to check out Daniel's visit to our school on Monday, September 12th! Jack noticed that Daniel wears a headband and wanted to make him a crown to wear over it! Julia, you always inspire me to be a better teacher! Love this and love you!!! You are to me what I am to you! !